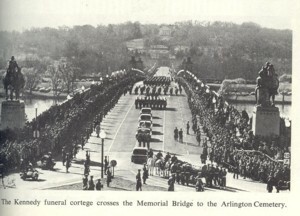 I was in the Army (2Lt) stationed in <?xml:namespace prefix = st1 ns = "urn:schemas-microsoft-com:office:smarttags" />Texas in 1963 when John F. Kennedy was assassinated. At the time of the assassination, I was deployed in Germany on Operation Big Lift (test of America’s ability to deploy rapidly). Both places gave me a special perspective on this historic event. The 2nd Armored Division had redeployed back to Texas on November 22, 1963. I was part of a rear detachment commanded by Brigadier General Stafford that remained in Germany for three additional weeks. German time was 6 hours ahead of Texas time. The assassination occurred in the early evening hours in Germany. I was the Duty Officer that night in the General’s office in Kaiserslauten. We had no television or radio. There was a portable radio downstairs in the Adjutant General’s office where I was normally working. 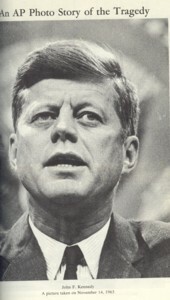 I then went downstairs and got the radio and heard the news that Senator Teddy Kennedy was presiding over the Senate and had just been told of the assassination. For a while, there was confusion about the Vice-President and whether this was a foreign attack. The phone started ringing. One Major wanted to know if we had been put on alert. He said that NATO forces were alerted. General Stafford called in to check on status of things. The next morning, we fell in formation (Field Grade Officers down to Privates) and were read the Official Proclamation of the President’s death. It was read by a veteran Sergeant. When he finished, he said something else that will always burn in my memory and even today influences my reaction to protestors, demonstrators etc. The Sgt. said,… “I think it is a G…. D…. Shame when the President of the United States cannot ride through the streets of America without being shot”! The whole event took on special meaning since we were in a foreign country. Over the next few days we followed the JFK assassination by radio and the Stars & Stripes. Downtown Department store Televisions were showing the Funeral Cortege and many other scenes about the President and his family. I was listening to the radio when Oswald was shot. That led to much more dramatic events and coverage. My group returned to Texas on December 5, 1963, by Jet. 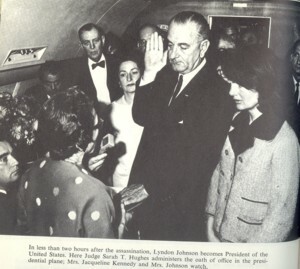 By then Lyndon Johnson was President and Bergstrom Air Force Base in Austin (where I stayed on many weekend visits to Austin) became the base for Presidential flights. It became far more strict on entry and movements. the park area around the site. I stood on the steps of the Texas School Book Depository and looked toward the site of the President’s limousine. A tree was in my path of vision but I noticed it would not be in the way of one in a window on the upper floors. The experience convinced me that Lee Harvey Oswald had a clear and straight shot at the President and was probably a lone gunman. I looked at the Grassy Knoll, the underpass and the whole scene in including the nearby Dallas jail where Oswald was held. 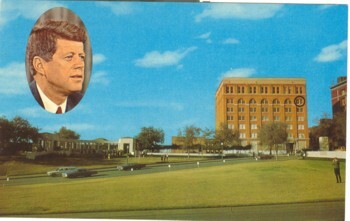 Later, my wife and daughter visited the site and I stood on the grassy knoll and walked around the parking lot. Based on these visits and volumes of reading, I have never believed anyone else was involved. I think Oswald was a nut and was the sole shooter. In later articles, we will discuss the Johnson ascendancy to the Office of President and his hometown and ranch that friends and I visited. At the time, this all happened I knew it was historic and of great drama. As the years have passed, I have realized even more the unique spots in which fate placed me at this historic time. I voted for John Kennedy and liked him. 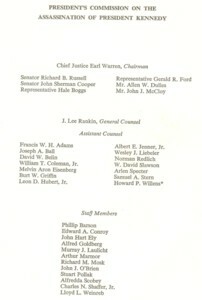 I was commissioned in the U.S. Army under his time as Commander in Chief. Like most Americans, I felt the assassination was a terrible event and a national tragedy. I have always felt that had he lived, he would have handled Vietnam differently from LBJ. He had much more substance than his youngest brother, Teddy. 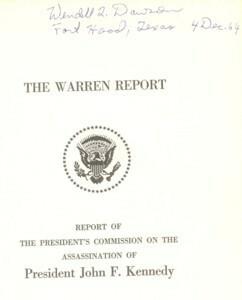 The Warren Commission Report was published by the Associated Press and I ordered a copy of the Report Summary from the El Paso Times. I also saved several newspapers and magazines and read quite a lot about the assassination and Lee Harvey Oswald. One person made a good point about conspiracy theories. He said that if Bobby Kennedy had believed it, he was still Attorney General and had the resources and connections to expose it. <?xml:namespace prefix = v ns = "urn:schemas-microsoft-com:vml" />"He didn't even have the satisfaction of being killed for civil rights . . . . It's — it had to be some silly little Communist." 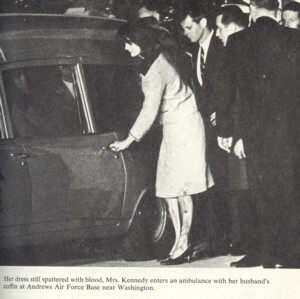 — Jackie Kennedy, on hearing that a leftist had been arrested for her husband's murder. It's the most controversial case in modern American history. Did Lee Harvey Oswald kill John Kennedy by himself, or did a conspiracy do it? And if a conspiracy did it, did the conspiracy include Oswald? If you are like most Americans, you believe that a conspiracy killed Kennedy. And if you are like most Americans, you have heard a vast number of bogus factoids about the case. Step into Dealey Plaza, and you feel you are on sacred ground. No, it doesn't matter that you may be a hard-bitten believer in Oswald's sole guilt. It does not matter that you believe that the assassination was an historical fluke, with no particular larger significance. This is The Place where all assassination buffs, conspiratorialists and lone-nutters alike, have to go. This is the necessary pilgrimage.